NACOGDOCHES, Texas - Stephen F. Austin State University music faculty member Nathan Nabb and collaborative accompanist Hyun Ji Oh will present a saxophone and piano recital at 7:30 p.m. Monday, Oct. 29, in Cole Concert Hall on the SFA campus. A feature of the SFA Friends of Music Concert Series, the recital will showcase pieces that are either originally written or arranged for string instruments and are by French composers in the late 19th or early 20th centuries, according to Nabb, professor of saxophone in the School of Music. The performance also serves as preparation for an upcoming recording by Nabb and Oh of the works. The program includes Sonata in A by Cesar Franck. "Originally for violin, this work is dedicated to famed Belgian violinist Eugene Ysaye," Nabb said. "In my opinion, this is one of the truly great works of chamber music. It has beautiful harmonies and melodies, demanding technical passages, and delicate interplay between the violin (saxophone) and piano." The arrangement for saxophone and piano was set by French saxophonist Jean-Yves Fourmeau. The program also includes Sonate posthume by Maurice Ravel. Written in 1897, it is an early work by the famous French composer and pianist, written when he was only 22. "Yet, it is unmistakably Ravel," Nabb said. "It's a beautifully lyrical work. 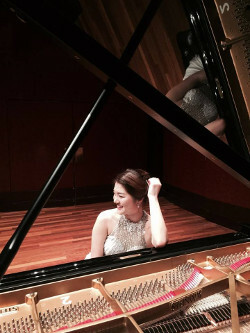 This is my first performance of this wonderful piece, and I recently completed the arrangement." The performance also features Sonate in C# by Fernande Decruck. "Though it fell out of favor after the composer's death, this piece has become very popular in the last 16 years, since the release of Calude Delangle's A la française recording," Nabb said. "Nick Bissen arranged the version performed on this concert. It takes much of the extended range published in the viola version of this work and incorporates it into the version for saxophone." 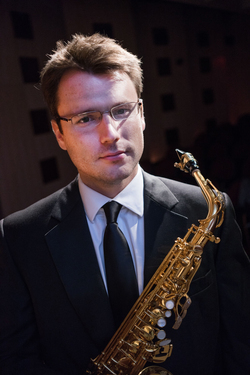 Bissen teaches saxophone in the School of Music.